LAS VEGAS — Newly-released surveillance video shows Las Vegas gunman Stephen Paddock in the days before he opened fire from his Mandalay Bay hotel room, killing 58 people. MGM Resorts said it released the video because it wanted to provide greater context around Paddock’s actions leading up to the shooting. The hotel said the images show that Paddock gave no outward indications of the massacre he was planning to carry out. 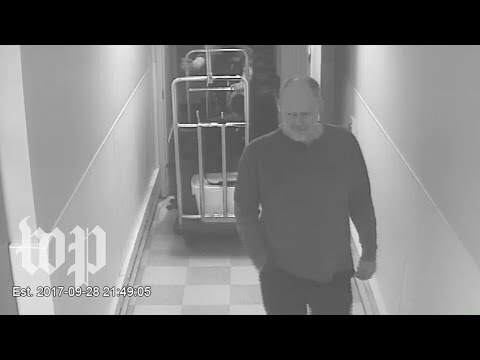 In the series of security videos, Paddock appears like any other guest. He checks into his suite on the 32nd floor, plays video poker and buys snacks at the gift shop – all the while interacting with hotel staff. “He’s so calm,” CBS News correspondent Carter Evans noted, watching the videos. “And that is the true mark of a sociopath,” said Randy Sutton, a retired lieutenant with the Las Vegas Metropolitan Police Department. Paddock can be seen coming and going from the hotel wheeling luggage to his room, sometimes by himself and other times with a bellhop through this service elevator. Over seven days, he brought in 23 guns in at least 22 pieces of luggage. “Should that have set off any alarm bells or red flags?” Carter asked. The security video tracks Paddock right up to the day of the shooting. He gambled into the early morning hours. That night, he would carry out the worst mass shooting in modern U.S. history. He killed 58 people and wounded more than 500. In January, investigators released a preliminary report saying police and the FBI believed Paddock acted alone. But nearly six months later, they still don’t have a motive. Paddock’s girlfriend Marilou Danley was initially named in search warrants in connection with the case, as police reportedly looked into her social media accounts for any clues. But she is no longer considered a person of interest.